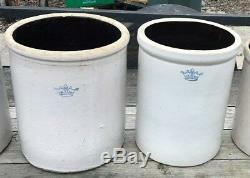 Seven Blue Crown Stoneware Crocks; Sizes 12, 10, 8, 6, 5, 3, and 2 gallons. 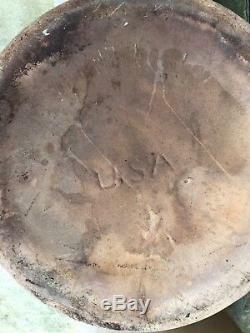 6 gallon crock is marked USA on bottom. 5 gallon crock is marked 5 gal. Others are not marked on bottom that I can see. All are in what I consider to be excellent condition with only minor flaws. The crown logos are all clearly visible but are more vivid on some than others. 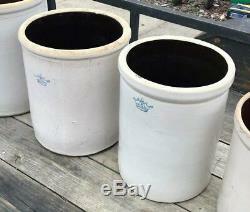 The three larger crocks appear to be just a shade lighter on the outside than on the four smaller. 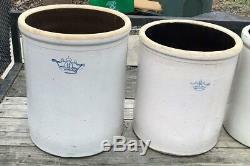 The item "Seven Blue Crown Stoneware Crocks Sizes 12, 10, 8, 6, 5, 3, and 2 gallons" is in sale since Sunday, January 27, 2019. This item is in the category "Antiques\Decorative Arts\Ceramics & Porcelain\Crocks". 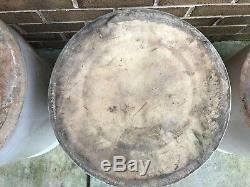 The seller is "abh10550" and is located in Greensboro, North Carolina. This item can't be shipped, the buyer must pick up the item.